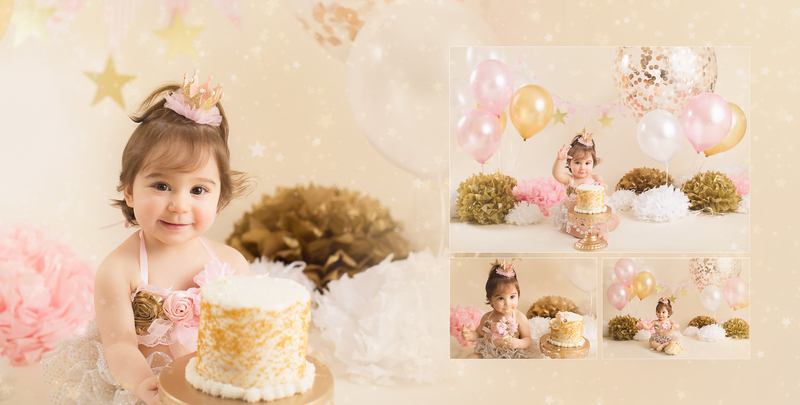 We had so much fun doing this awesome cake smash photography gold theme with Ayla last past week. All props were provided by her momma, as they’ll be used for her fabulous party next week. Working with Ayla was so easy and finally, we are so happy with the end results! can not wait to work with them again! This is one loved little girl. 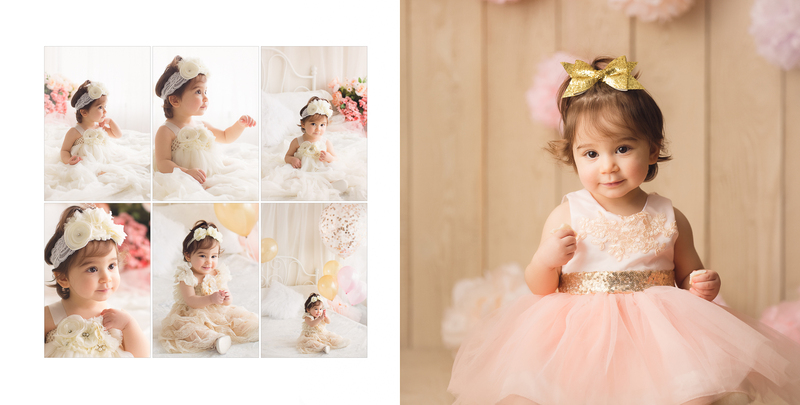 Arya’s family booked the baby first-year package for both newborn and one-year-old cake smash photography – This is the cover of her photo book. 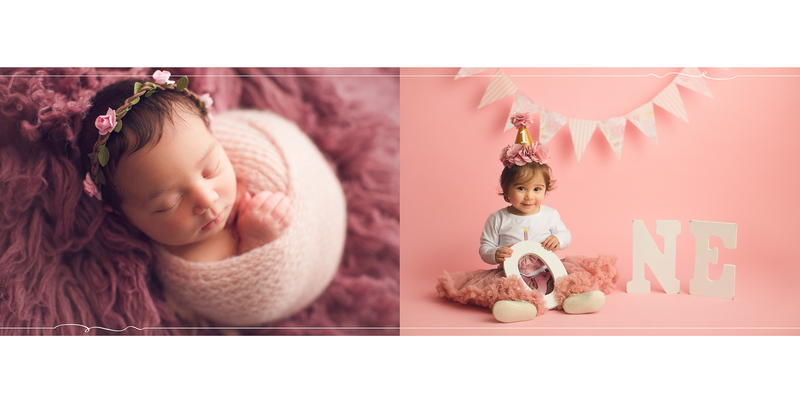 Arya rocked every single poses for her newborn photo session like, bump up, froggy, side, wrap and etc. She was so happy and calm with mom and dad holding her. 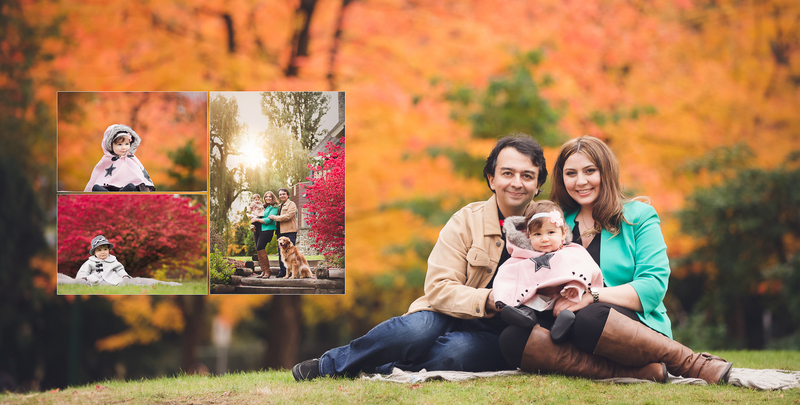 Fall in Vancouver and Burnaby (Deer lake park ) is fantastic and we had a chance to capture her 6-month-old photography session there. Arya is posing with her beautiful smile in front of the camera. Our natural light studio is giving us a dreamy look. after this classic portraite, we will be ready for cake! She is ready to stand but still need some help. A bucket full of flowers is the best help. Little Arya is ready to smash her cake. 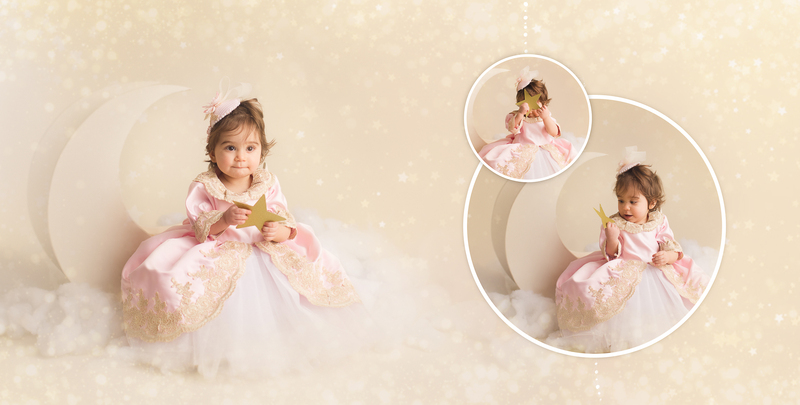 Her mom picked the pink and cake smash photography gold theme and she is glowing there. 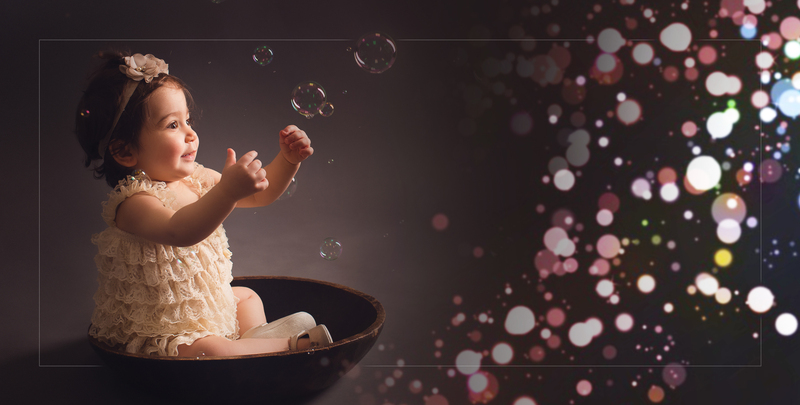 Bubbles are our best friend during a baby photo shot. everybody loves it. Here is the combination, maternity, newborn, baby and at the end one-year-old journey with so much love. Celebrating one-year old’s cake smash is such a fun and exciting time! It’s a great celebration to end this amazing year that your baby has been through. Let’s celebrate it together! Closer to the special day, you can check our availability. According to the time of day that your baby is happiest, we will secure your spot. We make all the arrangements and consult the theme colour of the session by sending you some tips. we will be discussing the options on the phone a few days before the photo shoot. We ask you what colour cake you are going to bringing, and based on that we will decorate our studio with flags, banners, balloons or some other props that we have. 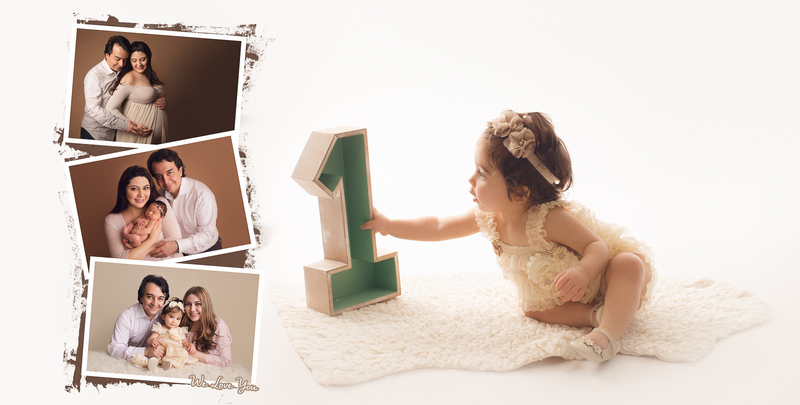 Clients are always more than welcome to bring their own props for their one-year-old photography session. Being one is always fun! We make sure to set-up according to your colour preference. Parents usually pick blue, green or grey for the baby boys and pink, peachy or purple for baby girls. 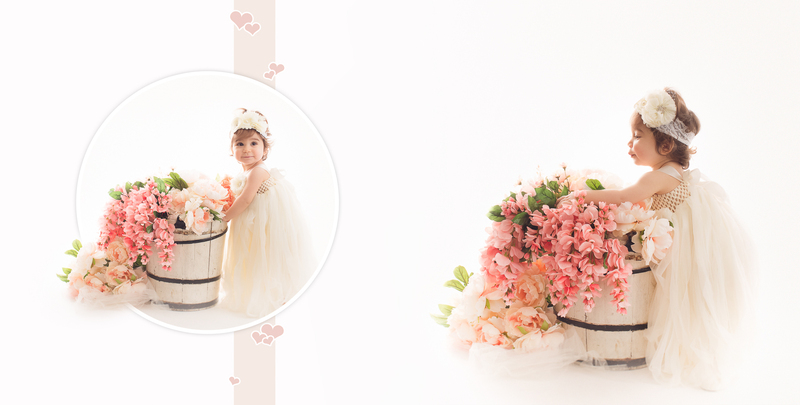 Ayla’s parent decided to go with cake smash photography gold theme and add some more pink to the setup. Before starting the cake smash, we start with the classic portraits and the other poses to ensure we get you a nice 1-year collection. We take a few family shots and also the combination of holding the letters “ONE”. This is a great warm-up for the baby. The cake smash will start and the real fun begins! To chose the best of your images and making your favorite collection we provide you a password protected online viewing gallery with the best photos of your session.